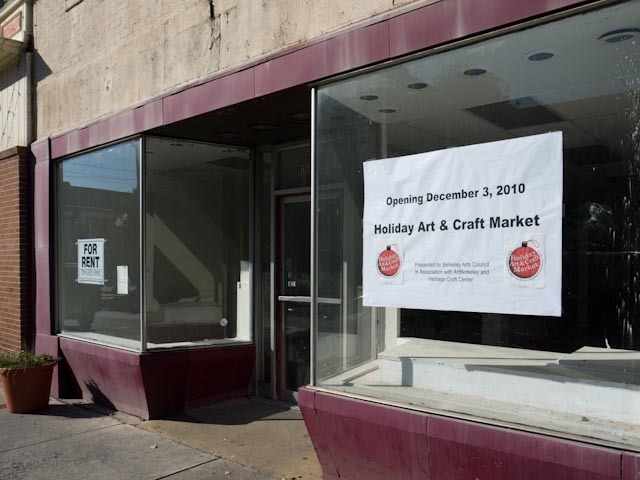 The Holiday Arts and Craft Market for downtown Martinsburg is coming together. Space is still available for interested artists. Contact Leia Wood at leia.wood@gmail.com or call 304-283.1326. We’re letting everyone know that we’re coming, starting with a sign in the window. By opening day we’ll have a wonderful array of original fine art and crafts created by some of our finest local artists and artisans, including potters, glass artists, photographers and painters, such as Mary Jo Bennett, Paul Berryhill, S.J. Brown, Hilda Eiber, Terry Harden, Judy Jeffares, Patricia Kinzie, Michael Pulsifer, Matt Sechler, Gail Siano, Carol Slovikosky, Sterling “Rip” Smith, and Leia Wood. The market will open Friday, December 3 at 3pm just in time for the Holiday festivities in downtown Martinsburg. Join us December 3 for a reception from 5-8pm and meet out artists and artisans. Watch the Main Street Martinsburg site for details on the other activities. The Holiday Market is a collaboration by the Berkeley Arts Council in association with ArtBerkeley, Inc. and the Heritage Craft Center of the Eastern Panhandle. A portion of all sales will be donated to the organizations. The date is Saturday, November 13 from 9am-1pm at the Martinsburg Public Library at King and Queen Streets in Martinsburg. The workshop fee is $35 for Berkeley Arts Council members or $45 for non-members. WordPress.com has become one of the most popular and easy to use ways to set up a web site. There is no cost to set up a basic site, and no programming or HTML skills are needed. * Setting up and customizing a free WordPress blog site. This is a hands on workshop. Participants should bring a laptop computer with wireless (WIFI) networking if possible. The only software you need for the workshop is your normal web browser. If you do not have a suitable laptop, please contact us. We have a limited number of computers that we can lend for the day. You can pay online with PayPal or a credit card, or you can print the payment page and mail it with a check. Registration deadline is Wednesday, November 10. The date is Monday, November 15 from 6-8pm at the Martinsburg Public Library at King and Queen Streets in Martinsburg. The workshop fee is only $10 for Berkeley Arts Council members or $20 for non-members. The workshop will cover basic recordkeeping and the types of things that are deductible for artists and artisans. The workshop instructor is David Decker of Decker & Company PPLC, a certified public accounting and consulting firm located in Martinsburg, West Virginia. David and his staff specialize in providing tax planning & preparation, financial statement preparation, accounting assistance & new business set up, and QuickBooks consulting for small businesses and individuals. David has twenty-three years experience in providing public accounting services. He is a graduate of Shepherd University with a degree in accounting and is active in the community as a member of the Sunrise Rotary Club, board member of the Martinsburg-Berkeley County Chamber of Commerce, and board member & coach with the Martinsburg Little League. David resides in Berkeley County with his wife and two boys.